How many times have you found yourself in a situation that you wish you had access to your files on your computer, while not at your computer? Thumb drives, CD's, and DVD's only hold so much data and can leave you sitting there wanting more. The most common solution to this problem is using an external hard drive enclosure. This allows you to add just about any size of hard drive you want, while not limiting you to minimal space. 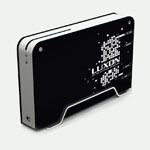 Today we are going to be taking a look at VIZO's Luxon Advanced 3.5 inch hard drive enclosure.